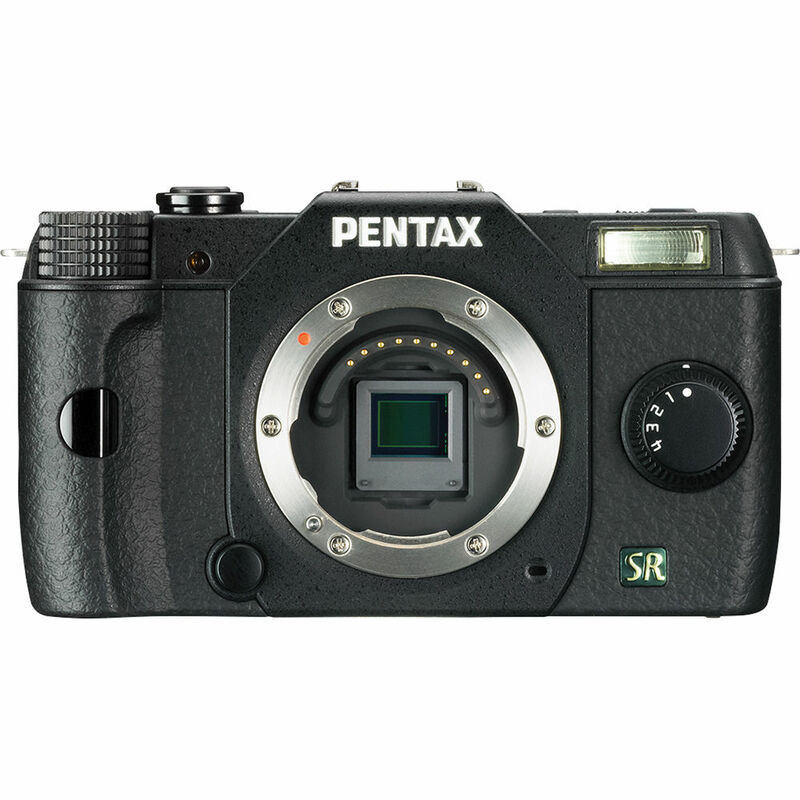 The black Q7 Compact Mirrorless Camera Body from Pentax features an upgraded 12.4MP 1/1.7" Backlit CMOS sensor. It produces low-noise images even at high ISO sensitivities (up to 12800) in both JPEG and 12-bit RAW formats. It is directly compatible with Pentax Q-mount lenses and also compatible with the Pentax K-mount lenses using an adapter. With fast autofocus, shutter speeds up to 1/2000s and continuous shooting rates of 5 fps at full resolution, the Q7 can capture quick action; and its numerous scene modes, assistive and creative features and in-camera shift-sensor shake reduction allow you to easily capture the tough shots. Full manual exposure as well as Aperture and Shutter Priority modes enable true image control and a built-in pop-up flash provides extra light when the need calls. A hot shoe mount for an external flash or optional viewfinder is also available. Full HD 1080p video capture at 24 and 30 fps is supported, and a built-in micro HDMI port enables you to view your movies on an HDTV. Movie mode also features a digital filter to add effects to your images and offers interval shooting for time lapse videos. A 3.0" LCD monitor with 460k-dot resolution provides image composition and playback. Images are stored on SD/SDHC/SDXC memory cards and the camera is compatible with Eye-Fi memory cards for easy transfer to Wi-Fi enabled devices. A larger 1/1.7" sensor upgrades the Q7 over its predecessor and provides high resolution, low-noise images in several aspect ratios and image sizes. 12-bit RAW images and JPEG files are supported, as is in-camera RAW processing. At 4.0 x 2.3 x 1.3" (10.2 x 5.8 x 3.3 cm) and a mere 6.35 oz (180 g) without batteries, the Q7 is among the world's smallest and lightest interchangeable lens cameras. Fast Autofocus speeds combined with shutter speeds of up to 1/8000 seconds (with the electronic shutter enabled) and 5 fps continuous shooting in full resolution means that you will catch the action as it unfolds around you. The Q7 can record videos in 1080p Full HD resolution in the MPEG-4 AVC/H.264 format. Videos can be recorded at 24 and 30 fps in 1080p, 720p and VGA resolutions. Interval movie recording is supported and digital filter effects, such as Water Color and Toy Camera can be applied to video images. A built-in monaural microphone is available to record sound for your videos. With a 100% field of view and 460,000 dot resolution, image composition and playback are clearly rendered on the TFT color LCD monitor. Anti-reflective coating and color and brightness adjustability enable you to see the screen in difficult lighting and a grid display, bright/dark area warning and a histogram assist in composing the ideal shot. Q-Mount lens system encompasses prime, zoom, fisheye and other types of lenses. With the optional Adapter Q for K Lens, you can also use the numerous K-mount lenses with the Q7 camera. The Q7 supports both autofocus and manual focus capability. Contrast detection autofocus provides several focus modes including Face Detection, AF Tracking, AF Select (25 Points), Select, and Spot. The camera features a dedicated LED AF Assist lamp and Manual Focus Assist. The Q7 performs TTL auto exposure metering including segment metering, center-weighted metering, and spot metering. In automatic mode, the camera will make all the optimal adjustments to get you the ideal shot. In addition, traditional DSLR exposure modes, such as P (Program), Av (Aperture priority), Tv (Shutter priority), and M (Manual) are available for more controlled imaging. Bulb shooting allows for extended exposures and Multi-Exposure allows you to shoot from 2-9 frames on top of each other with exposure adjusted automatically. Auto capture modes make it easy to capture properly exposed images of specific types of shots including Standard, Portrait, Landscape, Macro, Night Scene Portrait, Night Scene, Blue Sky, and Forest. Scene Modes allow you to set the camera to very specific types of shots: Portrait, Landscape, Macro, Moving Object, Night Scene Portrait, Sunset, Blue Sky, Forest, Night Scene, Night Scene HDR, Night Snap, HDR, Quick Macro, Food, Pet, Kids, Surf & Snow, Backlight Silhouette, Candlelight, Stage Lighting, and Museum. HDR (High Dynamic Range) mode is available in Auto, HDR1 and HDR2 and shoots three shots of the same high contrast scene then combines the three shots into one balanced image. HDR adjustment allows you to correct images specifically in their shadowed or highlight areas. In-camera Sensor-shift Shake Reduction stabilizes images for clear, blur-free quality, even in low-light conditions. Because it is camera body-based, it operates independently of the camera's lenses, offering the same amount of stability regardless of lens choice. The Q7 provides a built-in retractable P-TTL flash unit with a Guide Number of 16 (ISO100/ft) and sync speed up to 1/2000 seconds. Flash modes include: P-TTL, Red-eye Reduction, Slow-speed Sync and 2nd Curtain Sync. A hot shoe mount is also available for attaching an external flash unit or an optional viewfinder. The Q7 includes SILKYPIX Developer Studio 3 software for powerful and flexible RAW file processing. In-camera RAW image development is also supported for quick output of your enhanced jpeg files. With Interval Shooting you can create time lapse videos. Shot intervals can be set from 3 seconds to 24 hours up to a total of 999 images. Smart Effects modes, accessible via the camera's Quick Dial, give you the freedom to apply various creative effects to your images. Brilliant Color, Vintage Color, Warm Fade, Bold Monochrome, and Water Color are some of the effects available to you. Digital filters include Toy Camera, High Contrast, Shading, Slim, HDR, Invert Color, Extract Color, Color, Water Color, Posterization, and Fish-eye. Bokeh is the out of focus portion of the image background that helps to emphasize the subject, drawing the viewer's eyes to the most important part of the photo. The Q7 assists the experienced and casual photographer alike by offering a fine degree of extra control over image bokeh via an in-camera filter operation. A built-in micro HDMI port is perfect for outputting high resolution images and video, with sound, to compatible HDTVs. Playback viewing options are single frame, multi-image display (4, 9, 30, 56 segments), display magnification (up to 16x, scrolling and quick magnification available), rotating, histogram (Y histogram, RGB histogram), bright/dark area warning, detailed information, folder display, date display and slideshow. Digital Filters can be added to images after they have been taken and include: Base Parameter Adjustment, Toy Camera, High Contrast, Shading, Tone Expansion, Invert Color, Extract Color, Unicolor Bold, Water Color, Posterization, Slim, Fish-eye, Retro, Soft, Sketch Filter, Miniature, Soft and Starburst. Images can be edited in camera, adjustments include: Resize, Cropping (aspect ratio adjustment available), Index, Movie Editing (divide or delete selected frames), capturing a JPEG still picture from a movie, Red-eye Edit, and saving as a RAW file. SD, SDHC and SDXC memory cards are compatible with the Q7 and Eye-Fi cards can be used to send images directly to a Wi-Fi enabled device. Choose from a variety of creative modes, Smart Effect options, or camera settings to assign to the Q7's Quick Dial located on the front of the camera. Easily customize the setting or effect using the Quick Dial's 4 positions without having to explore the camera's menu system. English, French, German, Spanish, Portuguese, Italian, Dutch, Danish, Swedish, Finnish, Polish, Czech, Hungarian, Turkish, Greek, Russian, Korean, Traditional Chinese, Simplified Chinese, and Japanese. The external viewfinder O-VF1 fits into the hot shoe mount of the Q7, offering stable image composition, even in bright sunlight when viewing an LCD is traditionally a challenge. The O-VF1 works with the Q 01 (47mm equivalent) prime lens. Box Dimensions (LxWxH) 7.0 x 5.2 x 3.4"